Demi Lovato Plays ‘Who’d You Rather’ Between Nick Jonas & Kristen Stewart on ‘Ellen Show’ | Demi Lovato | Just Jared Jr.
Demi Lovato sings her heart out while performing on The Ellen DeGeneres Show, airing Monday (January 15). 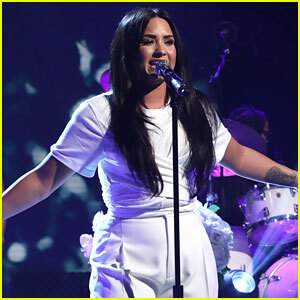 The 25-year-old entertainer appeared on the show to promote the director’s cut of her documentary Simply Complicated, chat up her upcoming tour, body positivity, and more. Since Ellen loves to put people in the hot seat, she played “Who’d You Rather” with Demi and put in the likes of Niall Horan, Kristen Stewart, Nick Jonas, Jesse Williams, Rihanna, and more. When Ellen asked Kristen Stewart or Nick Jonas, Demi quipped “Kristen Stewart” and laughed, as Ellen was trying to get some juice scoop on the ongoing rumors of Nick and Demi dating. LOL!